UTOPIA SHAPE 2006. This book is part of a series that compile several quotes by different authors, each of whom uses and ultimately defines the concept of utopia. I came across these quotes while reading about different topics since 2005. I have produced a book yearly with the material that I progressivelly find. Most of the authors presented here don't necessarily write about utopia; nevertheless they bring up this notion as a conceptual frame. 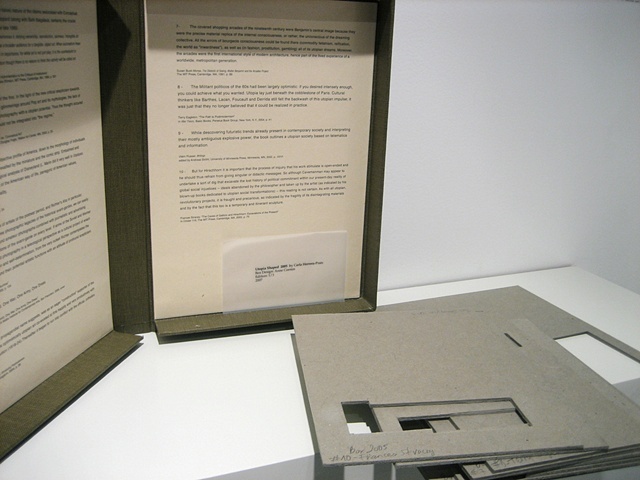 The book holds cardboard cut into shapes corresponding to the areas that these quotes occupy in the original printed text. Through archival research, Carla Herrera-Prats’ work comments on the cultural and economic transactions that flow, often invisibly, in the context of a transnational world. Her projects juxtapose photography and material from different sources questioning the documentary value of both images and text. Carla Herrera-Prats received her BFA at “La Esmeralda,” in Mexico City, and her MFA in Photography at CalArts, Los Angeles, and has been a participant at the Whitney Independent Study Program in New York. She was co-director of the gallery Acceso A in Mexico City and currently is part of the collaborative CAMEL. Herrera-Prats has shown her individual work in Canada, Colombia, Japan, Mexico, Philippines, Puerto Rico, and the United States, in venues such as Centro de la Imagen, Museo Dolores Olmedo, Centre Vu, Artists Space, Art in General and The Contemporary Museum, Baltimore. She is a recipient of the Fondo Nacional para la Cultura y las Artes “Jóvenes Creadores” scholarship for studies abroad; the Van Lier Foundation Fellowship, an interdisciplinary grant from CalArts; the Jumex Collection Support; and the LEF Foundation pre-production grant. Herrera-Prats was recently a Visiting Artist at the California Institute of the Arts, the School of the Museum of Fine Arts in Boston and has taught the Department of Visual and Environmental Studies at Harvard University.